The Sri Lanka Freedom Party (SLFP) rebel group supporting former President Mahinda Rajapaksa has decided to accept the Tamil National Alliance (TNA) leader R. Sampanthan as the opposition leader in parliament. A SLFP MP from the rebel group said that accepting Sampanthan as the opposition leader will only be a temporary measure and their struggle to appoint one of their own nominees for the post will continue as soon as the group entrench themselves in the “House” as the largest opposition team. A group of 36 SLFP MP’s and another 10 members belonging to constituent parties representing the United Peoples Freedom Alliance (UPFA) are planning to sit in the opposition from tomorrow onwards. 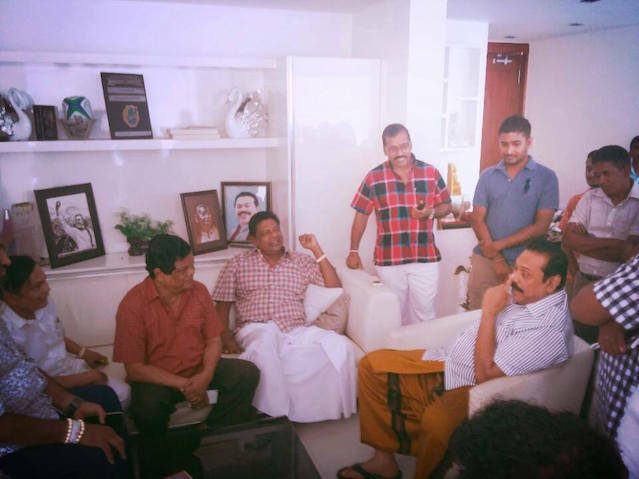 The SLFP MP said that the the rebel group will negotiate with both the TNA and the Janatha Vimukthi Peramuna (JVP) which put together has 22 seats to create a stronger opposition in parliament. However according to political sources, it is unlikely that either the JVP or TNA will support the rebel group as both parties have been highly critical of some members of this group in the past. The rebel faction is to be led by Kalutara district SLFP MP Kumara Welgama. However, it is clear that the one who will be calling the shots is Rajapaksa. The SLFP rebel group recently met party leader President Maithripala Sirisena to brief the latter on their decision. However, Sirisena had not taken too kindly to the suggestions made by the group. In an obvious snub Sirisena had told the group that he will refer their names to the newly appointed General Secretary of the SLFP, Duminda Dissanayake, without elaborating further on the matter. The SLFP sources said that it was unlikely that Sirisena will initiate immediate disciplinary action against the rebels but he would definitely do so in time to come.